I don’t think it really needs to be said, but I love coffee. The first thing I do when I go to a new place is to search for a coffee shop to try out – & the second is to try to find a bookstore, so I think my priorities are set in the right places. When I found out we were moving to Dayton, I was so concerned that for some reason, they wouldn’t know how to do good coffee in this random spot in Ohio. (I was spoiled by my east coast upbringing, I think) But after doing a quick Google search, I have to say that I was pleasantly surprised! Once we arrived in Dayton, we made pretty quick work of checking a few coffee shops I found off of my list. Somehow, though, I still haven’t managed to get to them all! Now that we’ve been here for over a year, I thought it would only be appropriate to do a series of posts that I’m going to call the Dayton Coffee Crawl – visits to every single local coffee shop in the area, with an overview and my thoughts on each one. 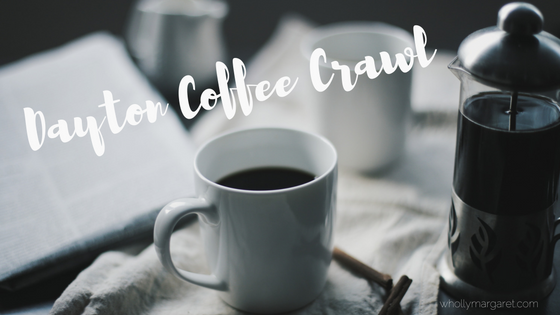 Traditionally, “coffee crawls” are single-day tours of a number of coffee shops in an area, resulting in some SUPER CAFFEINATED people. But I don’t have the time for that and goodness knows my heart can’t handle too many shots of espresso in one day!! It’ll be a slow crawl. I’ve got a short list going of places to check out, but would love any suggestions from my Dayton peeps! Keep an eye out on the blog for my first post, which will be on Ghostlight Coffee. I mean, I’m there at least once a week, so it’s only right to start it off with the place I visit the most! If you’re a coffee lover like me, what do YOU look for in a coffee shop? I wanna hear your thoughts!